Well, we’re down to the home stretch, folks. This is my final DC blog post. That’s right, I’ve read almost an entire bookshelf worth of DC trade collections, and I think I might need to be hospitalized. I’ve culled over a full shelf (about 100 trades) worth of trades, which unfortunately I’ve already replaced with recent purchases. Although I’m sick to death of superhero comics, I still have another full bookcase worth of superhero comics to read after this. But before I can get to my Marvel books, I have one more DC blog to write. Be strong. Be brave. 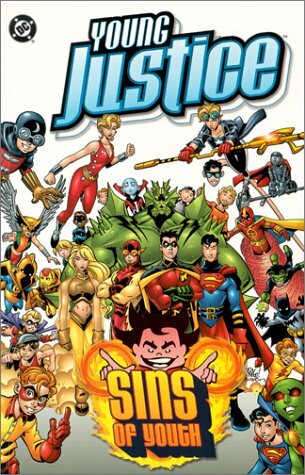 This w as a much-loved series from a few years ago that features a junior version of the Teen Titans. 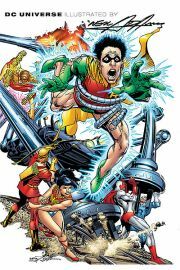 It featured Robin (later known as Red Robin), Impulse (later known as Kid Flash, than Flash, then dead Flash, then Kid Flash again), and Superboy (later known as Dead Superboy, and now just known as Superboy again) It’s written by Peter David, which means it’s heavy on funny, with a healthy dose on heart and soul. I thought I’d be culling this, but I was pleasantly surprised to find that it stands up quite well as a light-hearted, fun, superhero series, though obviously extremely goofy at times. A lot of the current relationships that are major parts of today’s DCU were set up here. A short, sweet, and entertaining one-shot that Paul Dini wrote a few years back. Definitely a nice mix of the superheroic and magic sides of the DCU. 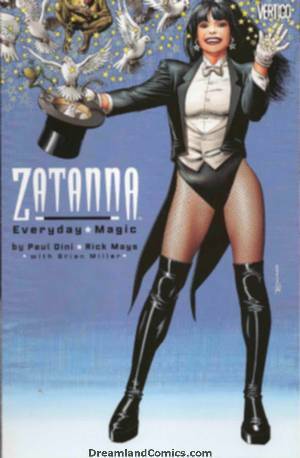 I wish Paul Dini’s new Zatanna series was half as good. When judging anthology trades like this, the rules are simple: There are going to be hits and misses. If the hits outweigh the misses, then you’re in good shape. Unfortunately for these, the reverse is true. 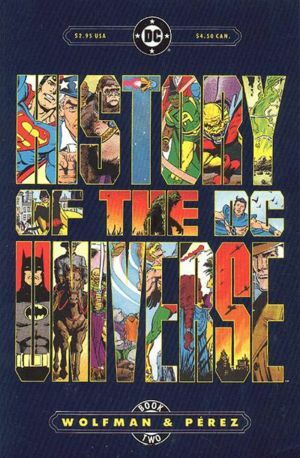 Secret Origins and Adventure Comics were fluff anthologies, with very little to keep the interest of anyone other than the die hards. The Alan Moore and Neal Adams trades are of higher quality, but ultimately disposable. Though obviously the art in the Adams trade is strong, the stories themselves are weak, and nowhere near the quality of his Batman or Deadman work from the same time period. 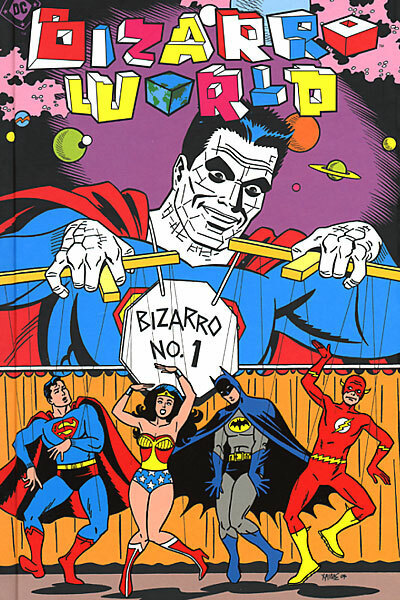 The Alan Moore trade is a cash grab, but there is only one good story in here to speak of (though it’s a GREAT one: Superman’s For The Man Who Has Everything with Dave Gibbons) it wasn’t worth keeping. For those of you who found Marvel’s recent Strange Tales anthology a little familiar, it’s probably because they stole the idea from DC. These two engaging collections consist of dozens of indie comics top creators riffing on their favourite DC characters. No rules, no guidelines, just fun. As you can imagine, the results are VERY mixed, but there’s fun and joy on every page. Highlights from the first volume include: Chip Kidd and Tony Millionaire’s take on Batman, Dylan Horrocks and Jessica Abel’s Supergirl and Mary Marvel story, and the critically acclaimed “Superman’s Babysitter” by Kyle Baker and Liz Glass. DC’s most recent mega-crossover. This started out extremely well, and the tension Geoff Johns builds at the beginning is palpable. Sadly, it soon collapses under its own weight, and becomes just a little too big for its own good. It’s also never really clear what the motivation of the villains is, which is never good, and is a happenstance all too common in DC books these days. Here is my number one rule regarding big events: The “event” should be able to have a start, middle, and end, all in the pages of its own book. There can be cross-overs and companion books, but the big beats should all take place in its own pages. DC breaks these rules more often than not, and so unfortunately you also need to get the corresponding Green Lantern and Green Lantern Corps trades to get all the major plot points. 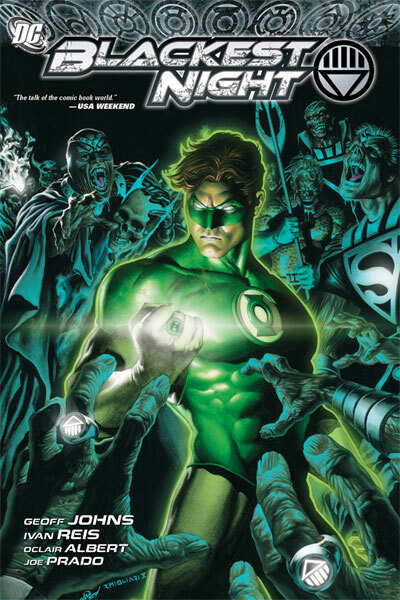 Still a good, creepy story for the most part, and a worthy pay-off to the last several years of Green Lantern comics. This is the grandaddy of all big event stories, and to this day is the gold standard by which all big events are compared. The problem is that it’s not really as good as you remember it being. Oh, the premise is sound: All of earth’s heroes team up to fight an intergalactic menace, with plot and art by one of the business’ top creative teams at the time. But the stories strengths are also it’s weakness’. This story is huge. So huge in fact, that’s it almost impossible to tell you what it was about. Characters float in and out with no explanation, plot points seem urgent but then get dropped immediately, and no one outside of a life long DC fan would be able to figure out who any of these people are. On the plus side: Some great character moments from a lot of neglected DC characters, the best art EVER in an event book like this (Seriously), and 2 of the best, if not the very best deaths in superhero history. Not to mention the final issue, which features a battle between Earth 2 Superman and the Anti-Monitor so drenched with action and drama that it’ll make your teeth hurt. An ambitious DC experiment that should have failed miserably, but instead worked so well that they’ve tried to replicate it ever since, though with mixed results. Here is the skinny: 4 of DC’s top writers at the time would team up with Keith Giffen and other artists to produce a 52 issue story, with each issue coming out once a week. Not only was the book never late, but the book was also extremely good. In fact, I can’t get over how great this was, considering how much of an editorial and logistical nightmare it must have been to produce. 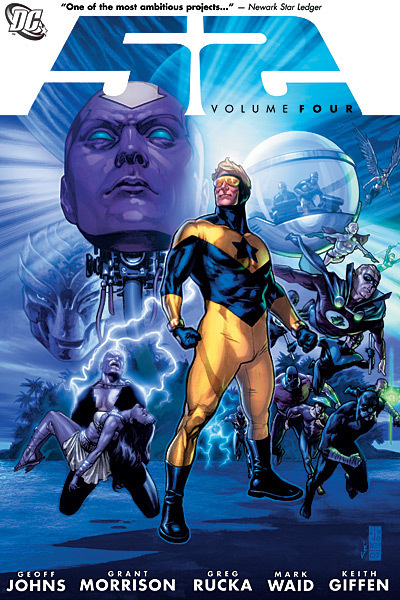 The best part is that it featured some of DC’s lesser known characters (The Question, Black Adam, Elongated Man, Animal Man, Doc Magnus, Booster Gold, etc), and many of these have gone on to become much larger parts of the DCU as a result. It’s one of my favourites of DC’s recent events books, and JG Williams covers are worth the price of admission alone. After the first Crisis, DC continuity was a bit of a mess. This was Wolfman and Perez’ attempt to set the record straight, and while it’s not much if you’re looking for a cohesive story, the art is gorgeous, and it’s a worthy companion to Crisis On Infinite Earths. This was (and still is), an extremely controversial story, and one that got fans riled up like a hornet’s nest. Here’s the premise: The wife of a B list hero is brutally murdered. In the frenzy to capture her killer, many secrets come to light, involving some tough decisions that our heroes had to make in the past. This was the beginning of DC’s recent descent into morbidity, and it’s not an easy read. But putting the actual events in the book aside, it’s a very powerful story, and works extremely well as a stand alone event. 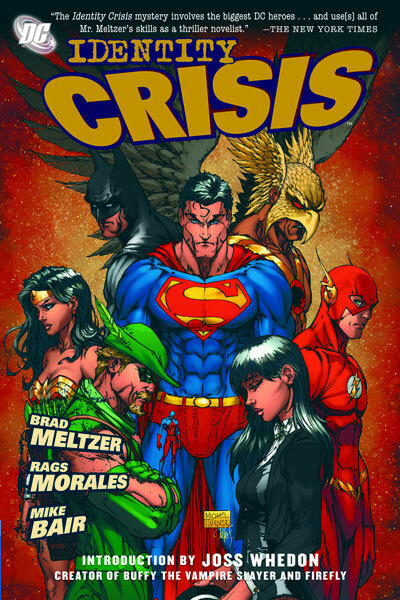 Brad Meltzer doesn’t do nearly enough comic book work, and Identity Crisis might be his finest moment. Add one of the best fight scenes in recent superhero comics, and you’ve got yourself a powerful, yet very disturbing read. DC embraces “big events” like no one else. Every time they do one, they put a dozen supporting minis and one shots, and before you know it, you’ve filled up an entire shelf just on their cast-offs. Obviously some good can come from events like this, but I’ve found that Marvel does a better job of keeping the quality high on their secondary books than DC has when in comes to recent big events. Although the events they’re tied to (Infinite Crisis and 52 respectively) are strong, Prelude andWW3 aren’t worth a second glance. The Rann-Thanagar War and Final Night both are decent reads, and while I’m not keeping them, they might be of interest to DC completists. This was more or less a sequel to the first Crisis, and it would be hard to conceive of a more complicated, unnecessary story. Remember when I said that a successful event comic needed to have all of its key plot points contained within the main book itself? 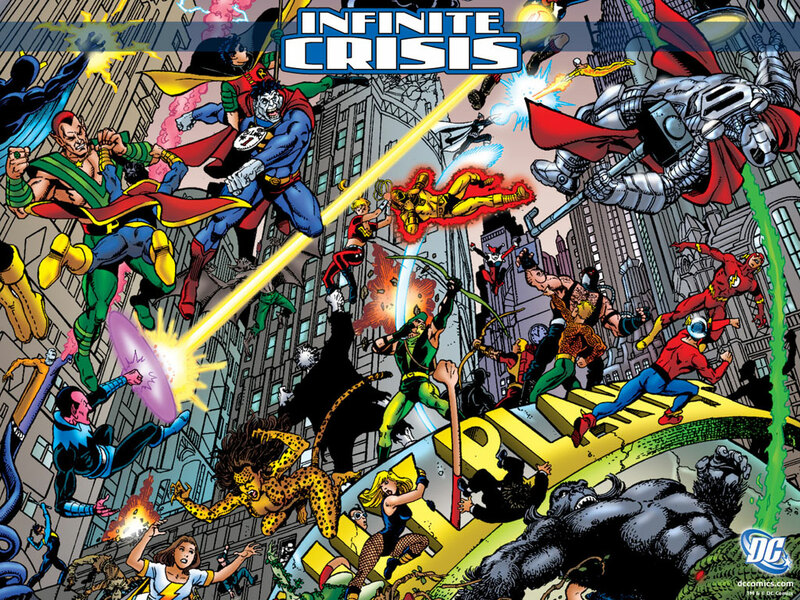 Not only does Infinite Crisis NOT do that, it barely has ANY major plot points in its own pages, and much of the actual story is spread among a dozen other spin-offs, one-shots, and cross-overs. Sadly, those stories (Villains United and Omac Project being the best examples of this) are often stronger than the main books itself. This story works ONLY if you read everything, and since I have, I guess it’s a success. But it’s really an overhyped mess, whose only real memorable moment is that it’s responsible for the best Blue Beetle story ever written. Kingdom Come is one of the most heralded DC stories of all time, and there are some good reasons for that. It’s set around 15 to 20 years in DC’s future. America is overrun with metahumans who spend all their time beating the crap out of each other, and the line between hero and villain is non-existent. As usual, it’s up to Batman, Wonder Woman, and Superman to save the day, but it takes some time for all 3 to get on the same page. This book is memorable for a few reasons. It’s Alex Ross who gets all the credit, and he deserves it. 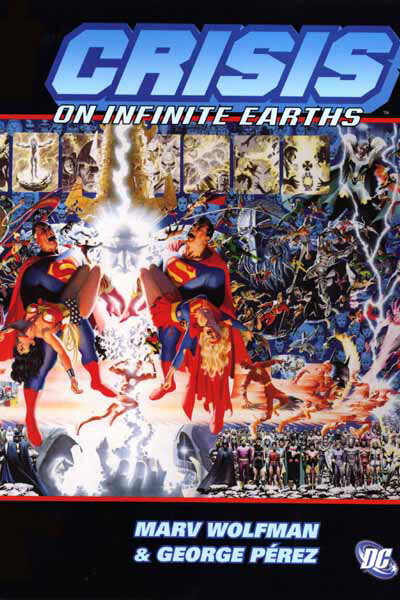 His painting has never been as good, or as focused as it was on Kingdom Come, and many of the new designs he gave some of DC’s iconic characters proved so effective that they are being used today. But I think it’s Mark Waid who is really the unsung hero of this piece. It’s his understanding of the inherent traits of each character that really makes this piece work, and I think any list of the greatest Superman stories of all time would have to include Kingdom Come. 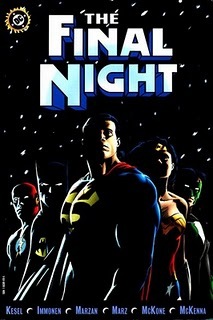 It’s a true epic, and I know of more than a few people who cite this as their very favourite DC story of all time. It’s follow-up, The Kingdom, hasn’t aged quite as well, but it’s a nice companion piece, and has enough backstory to some of the events in its predessesor to make it worth keeping. 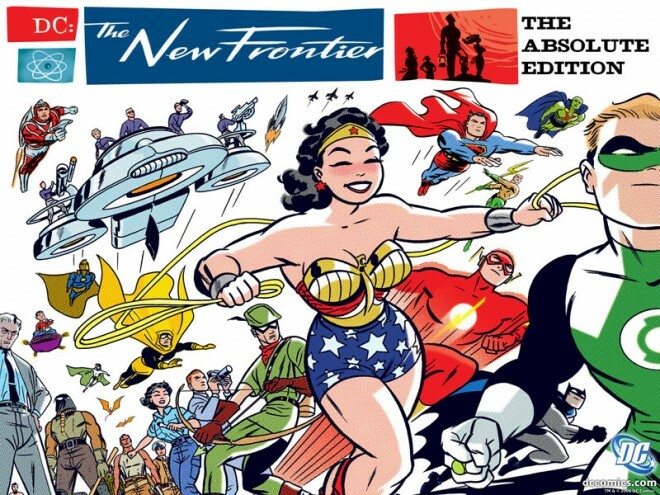 Although Kingdom Come gets far more mainstream praise, it’s Darwyn Cooke’s New Frontier that captured my heart, and I would have to say that it gets my vote as best DC event story of all time. That’s right. Of all time. Why? Because no one has captured the wonder and imagination of DC’s Silver Age like Cooke did. He gets right to the essence of each character, and it’s impossible to read this without a huge smile on your face. It’s one of my all time favourite comic stories in any genre, and if you haven’t read it, you’re really missing out. 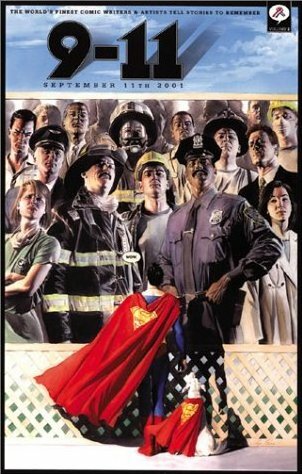 After 9-11, a lot of the comic book companies rushed to put out comics that showed their support for the victims. I thought that this one was the best of the lot. Though I don’t agree with some of the politics, there are some beautiful stories here, and it’s a snapshot of history that hopefully will never have to be repeated. Next up: What you’ve all been waiting for: MARVEL!!!!!! This entry was posted in Comic Books and tagged Crisis, DC, Kingdom Come, Marvel, New Frontier, Zatanna. Bookmark the permalink.